In the world’s richest nation millions are mired in poverty. The reason, the author argues, is an injustice deeply embedded in the Western economic model, taken for granted as slavery once was. He shows how a level playing field can be restored through a change in taxation. Walter Rybeck understands Economics and the causes of our past, current and future Economic problems. 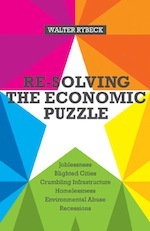 Government officials need to read "Re-solving the Economic Puzzle" and change their methods/systems of collecting public revenue. I found the book as moving as it was informative. The author's personal story s so compelling and illustrates what can and should be great about this country. The counterpoint between his memoir and his economic analysis makes accessible to me a whole technical world that has previously seemed foreign. We wish we had been in time to vote for this excellent book. Insightful and easy to read. Rybeck opens our eyes to a different way to deal with real estate that can free us from the destructive "boom-and-bust" economic rollercoaster. Rybeck's proposal would create a more just and productive economy. A must read for anyone interested in the land question and how the ups and downs of land values are linked to our economic fortune! This is a helpful contribution to the debate on our economic problem. It offers a creative new approach to solutions. This is an important book, which will tell you some things that the standard economic views of the left and the right will not. The author's reminiscences of growing up, building a career, and so forth are also of interest. I have been hearing great things about this book so I just ordered it. At this time of local to global economic crises we need all the helpful perspectives we can find in order to figure out how to respond and what direction we need to take to build a world that works for everyone. This comprehensive overview of what is wrong and what would be right if only we changed our systems of public finance, and the theft of our common public wealth by a framework so established and pervasive we hardly see it. The book provides real-world prescriptions for the failure of both economics and government to provide a fair and just society while providing an environment for sensible growth and prosperity. I have known this author for over 60 years and see his work as pivotal. The only problem is that more people in places of political power need to be made aware of his work. A study of this book and application of its theories and principals would, in all likelihood, reset the course of our country's future and help to restore us to our former strength and power as a world culture. Rybeck is right on the money. His dissection of the flaws in our economic system is superb, negating the "experts'" clueless explanations. Why not try something that always, always works? Mr. Rybeck offers his thoughts and experience thinking about and applying a revolutionary idea, one which can solve many of the world's problems, economic, political, and social. As an easy-read, non-technical book, it is also his story of an interesting and fulfilled life. I wrote the book to show there's a way to heal the economic crisis, a way consistent with the ideals of freedom. It shows how free markets can be treated so they will benefit everyone, not merely a privileged minority. Questions, comments and arguments are welcomed.